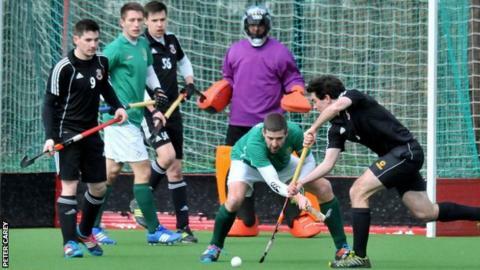 Guernsey player-coach Andy Whalley says his side are "thrilled" after beating Bourne Deeping 5-2 to reach their fifth successive EH National Trophy final. Josh Kendal scored twice, with Zak Damerell, Steve Waldrom and Sam Dawes getting the other goals. The Channel Islanders were beaten on penalty flicks in the final last year. "You only have to see how well the guys train - they're as determined as ever to hopefully go one better this year," Whalley told BBC Sport. "We're absolutely thrilled to get to the final - last year was really disappointing for us because we played well but came out second best on the day." Whalley's side will face Blackheath in the final on Sunday, 1 May at Lee Valley, which was used for the 2012 Olympic Games.